Welcome: was given by Tim Tolson, President. There were 20 members in attendance. Agenda Review / Changes and additions from the floor: There were no additions. Approval of the CCA’s last meeting's minutes (March 13, 2014): Karl Pomeroy made the motion that the minutes be approved and Lisa Goehler seconded the motion. Approval was unanimous. Fireman’s Raffle: Gary Dillon spoke briefly about the Crozet Volunteer Fire Department raffle of $16,000 this Saturday night, May 10 at the fire hall. Good meals and good place to meet your neighbor. He also asked if we had noticed the new all glass overhead doors into the Fire Company building? Several had and remarked how good they looked and how great it was to see the fire trucks now! A Moment in Crozet History (Phil James): Phil showed a slide of a photograph done by Holsinger on December 5, 1913. This was at our railroad station in Crozet before it was bricked. He compared the picture of then to what it is now. Times have changed. Drop-in visits from Albemarle County Police officer (Evening Patrol Division) : The policeman had a call dispatched and did not make it to the meeting. Albemarle Housing Improvement Program (AHIP) update on Orchard Acres and available grants for Orchard Acres home improvements (http://ahipva.org; Joyce Dudek, Associate Director of Community Development; and Ravi Respeto, Development Director) : AHIP is emphasizing safe at home for the children. Ravi spoke on AHIP trying to upgrade in energy efficiencies. They have helped 132 households and are concentrating on incomes between $20,000-$30,000 dollars. They have many volunteers and partnerships to help with the different projects. Their wait list is around 400 people. Joyce mentioned that AHIP has almost completed one year of their two-year project in Orchard Acres. Let them know if we know of someone who might qualify for AHIP assistance. Crime Prevention Watch neighborhood sign program, Crozet Safety Corp (http://CrozetSafetyCorps.org; Jim Crosby and Tom Loach): Jim spoke on the new signs and how they can be installed. There are several steps to getting these new signs purchased and installed. The Albemarle County Police will help in getting the VDOT permit. Every neighborhood that has a sign must have a member of the Crozet Safety Corp in their neighborhood as a contact person. Updates from the Crozet Park (Kim Guenther, Crozet Park President) : In the absence of Kim, Jo Ann Perkins spoke on the Arts and Crafts Festival, the survey of the park, the master plan of the park, Comcast Cares Days, and community volunteerism at the park. Please go to crozetpark.org and take the survey. The Green Olive Tree: Jo Ann Perkins spoke on this being the 35th year of operation of The Green Olive Tree as a business in Crozet. Update on the Build Crozet Library fundraising (http://buildcrozetlibrary.org; Bill Schrader) : Bill spoke on many statistics of the new library and that the Board of Supervisors have approved to extend the library hours more. The new library is the only LEED building that the Albemarle County has built and it has a silver LEED ranking. More money needs to be raised to complete the project for the furnishings. The usage of the rooms at the library stay booked. Update and schedule of Crozet Streetscape work. Tim Tolson spoke on the update of the streetscape from Trevor Henry. Everything seems to be right on schedule. Fundraising ideas to raise $1,000 for a “leaf” at Crozet Library giving tree? Follow status at: http://albemarle.org/CrozetStreetscape (or CrozetCommunity.org) Any ideas to raise 1,000 dollars for CCA to have a leaf on the library tree? Please share your ideas. Update on Barnes Lumber re-development proposal by Frank Stoner/Milestone Partners? http://www.barnes-lumber.com. Nothing new to report. Update on Acme Visible Records (Wilson Jones Property) Tim read a letter from Sarah Huddle, April 16. Recap of Fourth annual Crozet Fundraiser Swing Dance on March 29. The CCA raised over $1,000 to be shared by the Crozet Volunteer Fire Department, Western Albemarle Rescue Squad, and Build Crozet Library. 2014 Crozet Independence Day Celebration (CIDC) is Saturday, July 5. Parade line-up is 4PM, parade starts at 5PM. Celebration at the park at 6PM and fireworks at 9:30 PM. Next planning meeting is May 14 at 7:30 PM at the Firehouse. All are welcome to attend and help! Suggestions for two people to receive this year’s Good Neighbor Award: Mike Marshall nominated Jessica Mauzy and Bill Schrader to receive the Good Neighbor Awards. Several commented that both of them have done so much for Crozet community. Their nomination has happily approved. Other items: Suggestion made to clarify in the CCA bylaws that it’s permissible to allow the Good neighbor Award to be voted on at only one meeting instead of needing two readings and meetings usually required. Comments and Questions? – None at this point in the meeting. Crozet Community Orchestra (Lisa Goehler) Anyone can play in the orchestra. June 8th at Crozet Baptist at 6:30 PM. Crozet Elementary Glow Run: May 23rd. Watch for announcements. Crozet Lions will be selling gourmet hot dogs at Crozet Arts and Crafts Festival. Crozet Volunteer Fire Department (CVFD) Spring Fund Drive Raffle – Grand Prize is $16,000! Drawing this Sat., May 10 at the Firehouse. Dinner at 6PM, Raffle at 7PM. Barbecue Pork & Chicken. You do NOT need to be present to win! Crozet Arts and Crafts Festival, this Saturday & Sunday, May 10-11. They need your help to make it a success. Volunteer at: http://crozetfestival.com/volunteering-our-way-to-a-great-festival/ And also plan to attend and bring your co-workers and friends! The 2014 Crozet Farmers Market opened last Saturday, May 3, in its traditional location, the now-renovated parking lot of Crozet United Methodist Church (CUMC). 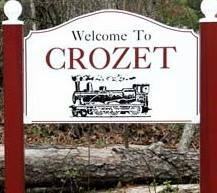 Crozet Community Advisory Council meeting next Thursday, May 15 at 7:00 PM at The Meadows. Everyone is encouraged to attend. Crozet Trails Crew – Zvarych-Rosinski Bridge dedication on Saturday, May 17th. Be at the first cul de sac on the left in Foothill Crossing at 9:30 am. Park along the road. There is a 10-minute walk on the trail to reach the bridge. Please invite friends and family– this is a great way to see part of the trail and be part of the community too! The Field School is having their Second Annual Field School Triathlon on Sunday, May 18 from 8 to 10AM. Virginia Broadband (Internet access) Survey: It is critical that all county residents and business owners, particularly those in rural areas, participate in the survey in order to establish important baseline data. Available on-line at: www.wired.virginia.gov/broadband/broadband-survey. Future Agenda Items – None were suggested. Tim Tolson closed the meeting at 8:50 PM. These minutes were prepared by Jo Ann Z. Perkins, Secretary of CCA. Welcome: Tim Tolson opened the meeting at 7:33, thanked everyone for being there. There were about 24 members present. Agenda Review / Changes and additions from the floor: Paul Grady asked to make announcement about his Ivy landfill petition, otherwise no changes. Approval of the CCA’s last meeting's minutes (January 9, 2014): The minutes were compiled from notes by Tim Tolson and Ann Mallek. Phil Best made a motion to approve the minutes as presented, Karl Pomeroy seconded, and they were accepted unanimously. Treasurer's Report by Emery Taylor: Emery Taylor could not attend, so Tim gave the report. There is $7,676.59 in the CCA checking account, most of which is earmarked for the Crozet Independence Day Celebration expenses. Tim reminded everyone if they haven’t paid their CCA for 2014, only $10; please see him after the meeting. A Moment in Crozet History (Phil James): (Phil James) Phil talked of what used to be in downtown in 1954. He showed a black and white image of aerial view of downtown area that is currently subjected to Streetscape. The 1950s era picture showed many houses and a center farm area, now gone. Lumberyard, Tabor Street Hilltop, Main Street (now Crozet Avenue) and The Square are clearly visible. Now gone are the Lyons house, shops next to Methodist church and the Blue Goose Building, and next to Cucina del Sol, as well as between Mountainside and Cucina such as the Bank of Crozet. Crozet Pool room’s old location later became doctor’s office (and more recently Emery Taylor’s dentistry). Albemarle County Police Officer Andrew Gluba, the Blue Ridge Division Crime Prevention Officer. About Community safety and preparedness. Officer Andrew Gluba, Crime Prevention Specialist with over 20 years service in Albemarle County Police Department. He covers the Blue Ridge District, which covers the western and southern portions of the county. Welcome: Tim Tolson, President, welcomed all at 7:35, calling the meeting to order. There were 16 members present. Approval of the CCA’s last meeting's minutes (November 14, 2013): Motion was made by Lisa Goehler to approve the minutes, seconded by Emery Taylor, and unanimously approved. Treasurer's Report by Emery Taylor: Emery Taylor, Treasurer, reported that the checking account has $7576.59. Deposit of $1,625 for July 2014 fireworks paid in mid-November 2013. Nearly all of these funds are designated for the Independence Day celebration, and in particular, for the fireworks. A Moment in Crozet History (Phil James): Phil James showed a picture of Crozet Avenue near current post office when we got a 12-inch snowfall the winter of 1959-60. One showed Billy Walker, Jr. plowing snow with mule drawn plow. Possible Drop-in visits from Albemarle County Police officer (Evening Patrol Division) As part of the new Albemarle County Police department community policing. Police Chief Sellers introduced Matthew Saullen and Ron Lance, both officers reside in Crozet. Mr. Pohl gave a PowerPoint presentation about the plans and timetable of the Crozet Streetscape. The slides are available on the Crozet Community website. The power lines along Crozet Avenue came down today. Dominion Virginia Power will remove the poles in a few days when the weather permits. Welcome to Crozet sign stolen! These signs were paid for by donations from residents of Crozet organized by the CCA. We'll be fundraising in September if we can't get the sign back. CULPEPER — The Virginia Department of Transportation will close Route 674 (Clark Road) in western Albemarle County Aug. 25-28, including overnight, for slope repairs on the roadway shoulders. The work will occur approximately two miles east of the intersection of Route 810 (Browns Gap Turnpike). Access will be maintained to entrances on both sides of the closure. Motorists should follow the posted detour route. Real-time road conditions and weather forecasts are available on VDOT’s traffic and travel website, www.511Virginia.org. The site also has live traffic camera images for many major highways, including Interstate 64, I-66 and Routes 29 and 250 in Central Virginia. Motorists can call 511 from any telephone in Virginia for road and traffic conditions on all major highways in the state. Call 1-800-FOR-ROAD (367-7623) 24 hours a day to report highway-related problems or request information about Virginia’s highways. Thursday, August 19, 2014 from 7:00 p.m. to 9:00 p.m.
* Meeting date and lcoation change. * Streetscape updates/issues if there are any – Will invite Trevor Henry. Our locally owned Blue Ridge Pizza Truck will be serving up its incredible pizza or, you can bring your own picnic. After the picnic, join us for the drive in movie, Little Mermaid, at the pool. Not a member? No problem. Daily pass rates are available: adults: $8; youth and seniors $3. WHY: To relax, have fun and meet your neighbors! Visit www.crozetpark.org for more information.